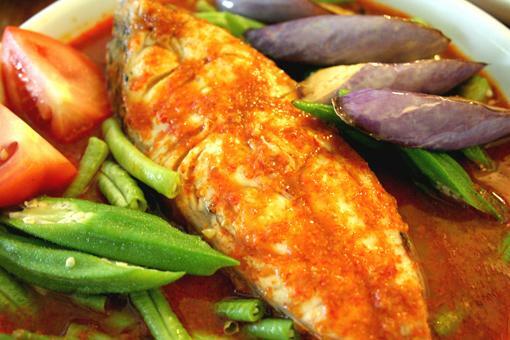 Asam Pedas is a Malaysian fish stew where fish is cooked in tamarind (asam) fruit juice and chili paste. The cooking process involves soaking the pulp of the fruit until it is soft and then squeezing out the juice for cooking the fish. Asam paste may be substituted for convenience. Various vegetables such as brinjals (Indian eggplants), okra and tomatoes are added. Fish (such as mackerel or red snapper) or fish heads are also added to make a spicy and tart fish stew. It is important that the fish remain intact for serving so generally the fish is added last. In Bengal, India this dish is called macher tak (sour fish). Taman Kota Laksamana, 75200 Malacca, Melaka. 308, Jalan Tun Ali, 75300 Melaka. 9. Restoran Sri Percik Sdn.Bhd. Batu ¾ Off Jalan Malim,75 200 Melaka. Lot 48, Jalan Sungai Putat, 75 450 Melaka. Jalan Merdeka, Banda Hilir, 75 000 Melaka. 75 460 Ayer Keroh, Melaka. Lot 85, Jalan Hang Li Poh, Durian Daun, 75400 Melaka. 123 Taman Melaka Raya, 75 000 Melaka. 107 Jalan Tun Tan Cheng Lock, 75 200 Melaka.